[*~ wd iv 2sy~*]: Friday the 13th!? Friday 13th... and its July..
Its Aisamuddin's birthday!!!! yayy!!! You're an old man now!! *hehehe* I just love making this a big fuss.. Its your 23rd birthday!! Let me start of by saying you're one of the best things happened to me.. You've been there for me.. you've made me laughed.. you've made me smile.. you've made me feel good when i need to.. you just know me in and out..
You've done a lot in your life.. Not all I know, but I'm pretty sure they were all the best that anyone could ask for.. You have the talents, skills, and other stuff that you could make your life almost perfect.. *almost because no one can have a perfect one :)* Therefore, cherish it and use it to the fullest.. There's still a long way to go.. And be assure that I am always by your side till the end.. There's more to learn and fear of.. 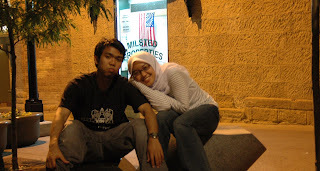 But whatever happens, I know you're up for it.. InsyaAllah~ Having said that..
LET ALL THE LOVE BE WITH YOU.. Thank you, for you and me.